The John T. O’Connor Senior Center at 611 Winona Street offers many activities for older people, everything from computer classes to exercise classes, to meals and much more. The center is open to anyone 50 years or older without membership or cost. One of the popular group activities there is the Happy Hikers Hiking Club. 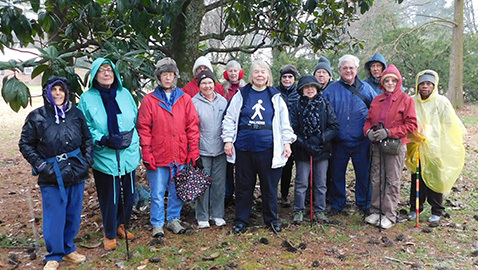 As the Happy Hikers Hiking Club grew, Joyce Dukes noticed that the older seniors were having difficulty in keeping up with their junior members. “The Thursday Walkers is an offshoot of the Happy Hikers. The hikes were becoming more difficult, longer and further away,” she told The Focus. “I started Thursday Walkers about five years ago when the senior center lowered the age there to 50. Before it had been 60 years old,” Dukes explained. “We walk mostly on greenways, state parks and the easier trails in the Smokies. Sometimes we end up with a sit down meal together in a restaurant or picnic when weather permits,” she continued. The ages range from the 60s to the 80s. Dukes describes herself as the coordinator, not the leader, and tries to get input from as many walkers as possible as to where to go, what trail to take, and identify where they are going. Dukes writes about the places they are planning to go for the Happy Hikers monthly newsletter and then she writes a report on each experience after the walk. “Occasionally we are able to join with other hikers when they choose an easier route and we take part in the yearly August picnic and Christmas Party. The goal is maintaining friendships, getting exercise and enjoying nature and ourselves,” she said. A Knoxville Focus story about Brushy Mountain Prison inspired the group to take a walk at Frozen Head State park and a tour and lunch at the nearby former federal prison in Petros. Members of the Thursday Walkers on a recent rainy day walk at the Knoxville Botanical Gardens included Dukes, Almetor King, Kate Kendrick, Linda Bolen, Thomas Bolden, Rita Dennis, Dorothy Bowles, Donna Tope, Mack Phillips, Bob Hill, Carl Porter, Jamie Hill, Sally Schroeder, Hilda Lipe and Beverley Hammond. Back in the summer Dukes was approached by the staff of Trinity Hills Assisted Living who wanted to form a partnership and challenged the Thursday Walkers to walk and record their steps to see if they could walk the distance from Knoxville to Nashville. Each step in their walks around our area counted as a step toward Nashville. “We did it and Trinity Hills gave the group a victory party last Thursday at the O’Connor Center,” she said. For information on the Happy Hikers, Thursday Walkers, or any other program at the O’Connor Center you can call 865-523-1135 or find the center’s programs online at www.knoxseniors.org/oconnor/ or you can find the center on Facebook. You can also get information from Knox County and the City of Knoxville for various programs as all the senior and community centers.